Q. How many anglers on the boat? A. We can comfortably accommodate up to six anglers. When you book with us, you’re booking the boat and we won’t put anyone else in with you. Q. How many fish can we keep? A. We recommend only keeping what you can reasonably eat. Most restaurants in Key West are happy to cook your fresh catch for a very reasonable fee. Keeping enough to have lunch or dinner while you’re here is a great way to enjoy your catch while at the same time not over harvesting the resource. Q. Do we need to buy a fishing license? A. No you don’t. Fishing licenses are included with your charter. Since the boat is licensed, you’re licensed as well. Q. Is the water rough? A. We want to keep you safe. We fish out of one of the biggest center console boats in Key West and it handles big water well. If it’s too rough then we will fish where it’s calmer. If you’re prone to motion sickness we always recommend taking a sea sick pill such as Dramamine, the night before your trip and another the morning of your trip. A. No, we just focus on the fishing. We do have bottled water on the boat. Please feel free to bring whatever you want to eat and drink on the boat. We have a built in cooler for you to keep it in. A. No. There are no hidden fees on our trips. A. Yes it is, but only if you had a good time. 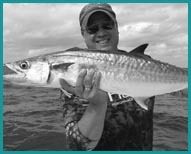 We work hard to make sure your trip is the best it can be and take pride in producing world class fishing. A typical tip to the crew is 15-20% of the total. Key West is a very expensive place to live and operate from and tips are part of our necessary income. Q. What if it’s rainy or the wind is blowing? A. If it’s going to be dangerous to take you out (we make that call), then we will refund your deposit. We want you to be safe. Rain and wind don’t keep us off of the water unless it’s a big time storm. We monitor several live forecasts and know where we can and can’t go, we don’t rely on the morning weather report out of Miami. A. Please let us know more than two weeks out from your trip and your deposit will be refunded. If you just don’t show up for your trip, then you will be charged the full amount. If you cancel the day before your trip then you will also be charged the full amount. A. Yes that is no problem. Please consume in moderation so you can truly enjoy the fishing side of your trip. No underage drinking. Q. Can we smoke Marijuana on the boat? A. No. We need to comply with federal regulations that prohibit this. Q. Do you own the boat? A. Yes Kevin Newell is your captain and the owner of the Liberty Gun. Q. Do you fillet our catch? A. Absolutely. Please bring a cooler to put your fillets in. Allow room for ice as well.